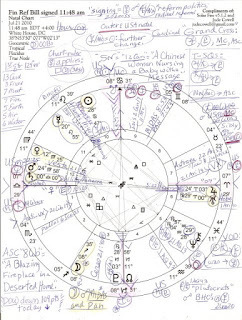 President Obama signed into law today his Financial Reform Bill @ 11:48 am edt White House, DC; Hour of Mars; chart-ruler Venus 12Vir25 is in 12th house and makes one major applying aspect (how things will proceed): a square with the Moon (the people); US natal Saturn 14Lib48 is our first natal planet to rise. With separative South Node of the Moon at Mc (The Goal Point), Fixed Star Alhena (to have a mission) at Mc, and the above-mentioned Moon/Venus square, I don't expect the bill to garner much support from the American people especially with the constant and tiresome undermining from the opposing political party whose determination to cause Obama's failure as President affects America the Nation's failing or succeeding as well. Uranus/ASC = Pluto: use of force; a desire to attain success even under the most difficult circumstances; commanding success. There's a midpoint of energies opposing Mercury 20Leo55, planet of contracts and such...the combo = radical reforms; reformist policital groups. Another picture of interest: Mercury/Mc = Sun: further change. 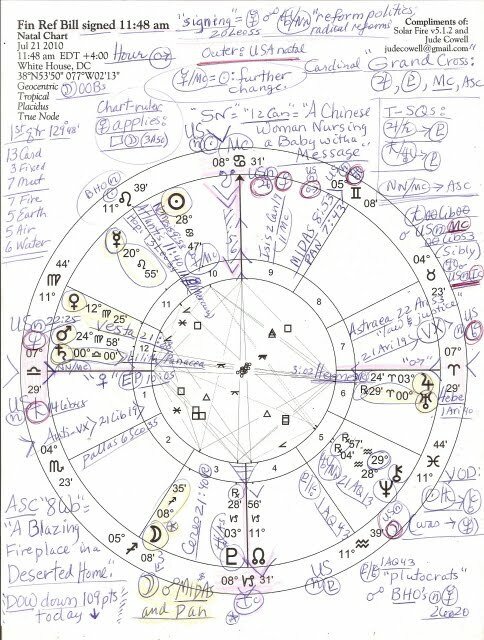 A YOD between Sun/Saturn (sextiling one another still but just barely since Saturn changed signs) was pointing to an apex Neptune but now points to a crisis-ridden 29th degree: Chiron 29AQ57 Rx in 5th house of Gambling and Speculation. And as you see, the ongoing opposition of wealthy, secretive Pluto to US natal Venus is on the Mc/Ic axis, the security/career axis - not a good portent for the signing, imho, yet it is one of the many reasons that reform is necessary. SN at Mc has this Sabian Symbol: '12Can' = "A Chinese Woman Nursing a Baby with a Message" - and you know, this isn't the first time in recent weeks that a reference to China turned up in a US mundane chart, for obvious reasons: China is our #1 creditor, and Pluto the Dragon echoes China's national and traditional archetype of The Dragon. So, the Dragon it is, opposing our evaluating Venus, one of the money planets. 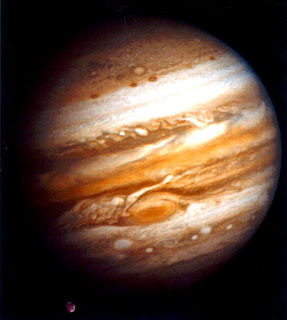 Our n Jupiter is within orb of Pluto's opposition, too. Double dip recession? 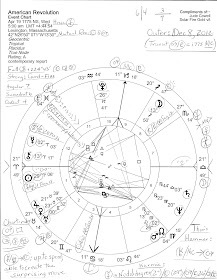 Sun (the leader) 28Can47 in 10th house, a bright and shiny place, yet Sun opposes US natal Pluto (in the 4th house of this chart' US natal planets are scribbled outside the chart in red) which indicates that others will firmly stand in one's way when trying to get to the bottom of things. If this bill is a power play, it won't work as far as secret hand Pluto is concerned. As a power move against the American people, it will be blocked or resisted but is now on track to be ruthlessly forced upon us, unintended consequences, or no. Additionally with Sun opposing our national Pluto, others may be jealous or intimidated by the events of the day, by the power wielded by the President. Be that as it may or may not be, today Mr. Obama got to play boss and sign another large piece of legislation - and the DOW closed down this afternoon 109 points. Perhaps Wall Street is pouting. Someone is trying to take away their red truck and they only have 1,000-gazillion-bazillion blue ones, boo hoo. Plus, there are interesting items tucked into the new reform bill (one concerns Jim McDermott's 'conflict mineral' provision) and many specifics are not yet written - guess they're still in the 'vision' stage - but not to fret. For hordes of lobbyists are already on Capitol Hill and working to sway how the specifics are written in favor of the financial, real estate, and insurance industries. Meanwhile, the careless-with-oversight ratings agencies (S&P, Moody's, and Fitch) are up to shenanigans, too, concerning the bond markets. Seems they're afraid they could get themselves sued. Oh really? Integrity in one's business doesn't often lead to getting sued, my financial friends! Oh ye Ponzi-enablers! Oh, and transiting Saturn 00Lib00 conjoins US natal Mc 00:53 in the Sibly chart, and opposes more closely tr Uranus 00Ari29 Rx, both planets now in Cardinal (active, outgoing energy.) Jupiter 3Ari24 Rx travels in tandem with Hermes, one of trickster archetypes...aka, the magician or alchemist. 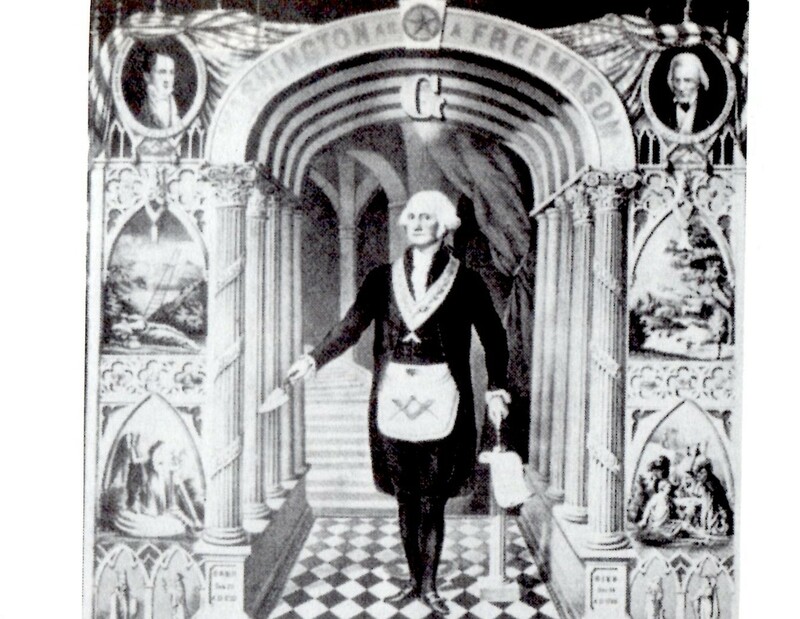 Speaking of alchemy, I wonder if anyone has spotted in the bill provisions that concern gold or the gold market? Plus, tr Midas 8Gem53 (conjunct US n Uranus 8:55) and Pan, another trickster element with a 'panic' vibe @ 7Gem43 - both opposing the people's Moon in Sagittarius. So please click to enlarge the image for more details, consider this horoscope and the situation as you will, and get back to me with a comment, if you may, because LINK TV is rebroadcasting Orwell Rolls in His Grave right now, a documentary about media being part of the problem rather than being the public watchdogs that Thomas Jefferson thought they'd always be on behalf of the American people. All these class warfare 'players' are part of a global crime syndicate, and have weakened our democracy over decades. And I fear that we haven't held on to our republic very well either. Over the past two years, we have faced the worst recession since the Great Depression. Eight million people lost their jobs. Tens of millions saw the value of their homes and retirement savings plummet. Countless businesses have been unable to get the loans they need and many have been forced to shut their doors. And although the economy is growing again, too many people are still feeling the pain of the downturn. Now, while a number of factors led to such a severe recession, the primary cause was a breakdown in our financial system. It was a crisis born of a failure of responsibility from certain corners of Wall Street to the halls of power in Washington. For years, our financial sector was governed by antiquated and poorly enforced rules that allowed some to game the system and take risks that endangered the entire economy. Unscrupulous lenders locked consumers into complex loans with hidden costs. Firms like AIG placed massive, risky bets with borrowed money. And while the rules left abuse and excess unchecked, they also left taxpayers on the hook if a big bank or financial institution ever failed. Now, even before the crisis hit, I went to Wall Street and I called for common-sense reforms to protect consumers and our economy as a whole. And soon after taking office, I proposed a set of reforms to empower consumers and investors, to bring the shadowy deals that caused this crisis into the light of day, and to put a stop to taxpayer bailouts once and for all. (Applause.) Today, thanks to a lot of people in this room, those reforms will become the law of the land. Now, let’s put this in perspective. The fact is, the financial industry is central to our nation’s ability to grow, to prosper, to compete and to innovate. There are a lot of banks that understand and fulfill this vital role, and there are a whole lot of bankers who want to do right -- and do right -- by their customers. This reform will help foster innovation, not hamper it. It is designed to make sure that everybody follows the same set of rules, so that firms compete on price and quality, not on tricks and not on traps. With this law, we’ll crack down on abusive practices in the mortgage industry. We’ll make sure that contracts are simpler -– putting an end to many hidden penalties and fees in complex mortgages -– so folks know what they’re signing. With this law, students who take out college loans will be provided clear and concise information about their obligations. And with this law, ordinary investors -– like seniors and folks saving for retirement –- will be able to receive more information about the costs and risks of mutual funds and other investment products, so that they can make better financial decisions as to what will work for them. So, all told, these reforms represent the strongest consumer financial protections in history. (Applause.) In history. And these protections will be enforced by a new consumer watchdog with just one job: looking out for people -– not big banks, not lenders, not investment houses -– looking out for people as they interact with the financial system. In the end, our financial system only works –- our market is only free –- when there are clear rules and basic safeguards that prevent abuse, that check excess, that ensure that it is more profitable to play by the rules than to game the system. And that’s what these reforms are designed to achieve -- no more, no less. Because that’s how we will ensure that our economy works for consumers, that it works for investors, that it works for financial institutions -– that it works for all of us. This is the central lesson not only of this crisis but of our history. Ultimately, there’s no dividing line between Main Street and Wall Street. We rise or fall together as one nation. So these reforms will help lift our economy and lead all of us to a stronger, more prosperous future.